Over its 168-year history, New York Life Insurance Company has been a leader and visionary organization in the financial services industry. More than a hundred years ago, New York Life was the first company to issue policies to women at the same rates as men. The pioneering company has a history of recognizing the changing dynamics of America. Now, the $34 billion Fortune 500 organization is building for the next century by targeting the Hispanic market. 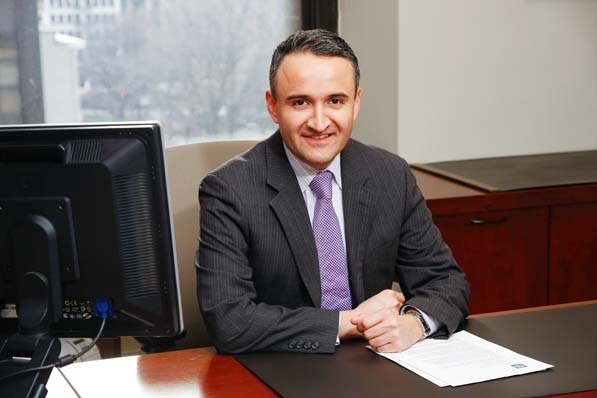 Corporate vice president Hector Vilchis isn’t simply dedicated to offering Latinos good financial products—he wants to help develop Latino leadership and success in the United States to impact the future of America. Living a good life. Not necessarily wealthy, but a good all-around life. The future. Looking into uncharted territory. A fundamental value. Living a life of purpose. You cannot live a life of purpose without integrity and vice versa. How did your unique childhood prepare you for multicultural work? I was raised on the border in Tijuana, so I was exposed to both cultures and both languages right away. Then we moved permanently to San Diego when I was 14, and later I was able to study international business and also pursue an MBA. I’ve had a lifelong passion for what I call the world of ideas, and with that comes an interest in how things are made and built. Entrepreneurship, business strategy, travel, history, politics, and the humanities are big interests of mine. I’ve had the fortune of visiting some unique places like Egypt, Turkey, Austria, and South America. My first few jobs were in the pharmaceutical sector, and as an international sales manager, I set up networks across Europe and the Middle East. I was loving business and wanted to experience corporate America at the highest level. That’s when I found out that New York Life was expanding their efforts in the Hispanic market. What did that look like in the early days? In 2000, we were building our broader strategy and looking at revenue-generating opportunities. We knew the Hispanic market would be a major source of growth over the next 30 years as we saw what was happening to the growing demographic all around us. It was going well, but really picked up steam in 2009. Since then, we’ve implemented a strategic model for growth and expanded our team to more than 40 full-time employees working on our Latino initiative. We have 1,500 financial professionals that are part of this, and we’ve more than tripled our revenues in the Hispanic market. We want to really serve the Latino community and make it a competitive edge for the company. We’re the largest mutual life insurance company in the United States, but when we looked at the growing Latino population we knew we didn’t have enough bilingual professionals in our company to serve the market. The first driver, then, was increasing our talent pool by both attracting new recruits and developing managers. That’s what took us from 400 financial professionals in this area to the 1,500 I mentioned. Then, we work to provide resources, support, and strategies to help them not only be successful, but to give financial education to the community. We use in-culture and in-language concepts, campaigns, and materials to teach the value of insurance and savings. Hispanics at all income levels are underinsured. They underuse financial products and services. We work with groups like ALPFA and chambers of commerce across the country to educate on the importance of financial planning. Thirdly, we are really paying attention to growing wealth in the Latino community, because we are starting to see more need for estate planning, wealth management, and charitable giving. We are incorporating more of our advanced strategies into the Latino community, because that is the direction it’s going. Do you see this as a long-term vision or more of a trend? It’s absolutely long term. We’re not just experimenting here—it will be a major part of our growth long into the future. We are now building the next stages and talking about steps beyond recruitment and development. We are building the right partnerships in the community. A critical part of our structure that allows us to invest in the long term is our mutuality. As a mutual company, we are able to take a long-term perspective on our growth and profitability, and thus invest in strategies that drive growth and sustainability over time, as well as benefit the company and the community in the future. Our company is one that is there to do the right thing. We say we are about keeping good going. Life, family, security: our presence in the Latino community is about embracing these values. As the community grows, that brings economic development. That brings bigger positions in government and business. With that comes the responsibility to preserve wealth for future generations and to benefit society. Then leadership development becomes especially important. Exactly. If we don’t protect wealth and develop leaders, we will miss a huge opportunity. And I get to see this working every day. We see young families and business owners, and we see the impact that helping Latino families build a secure plan for the future can have. Everything they came to do in this country is being preserved and multiplied. It’s an exciting time.